Around 25 boys and girls aged between 10 and 14 attended a development session last Thursday evening on the facility opened in February. At 60m by 49m, its about half the size of a normal pitch, and can be used for mini hockey matches. Rose Hill is keen to share its new facility with local community groups. This is the first time that the Alderley-based Independent Preparatory School has linked up with a local club. A Rose Hill School spokesman commented: "We are delighted to have been able to work with the hockey club and look forward to developing a long term relationship that will be of mutual benefit to their members and our pupils. Now the pitch is ready, we shall be exploring opportunities to develop similar working partnerships with other interested clubs." Junior coach James Pullin explained that there were several advantages to using Rose Hill's facilities: "It allows us to teach the skills they'll need as they progress to senior level and the location means far less travelling for the children and their parents"
Pullin was ably assisted at the session by club stalwart Willie Cruickshank as well as older brother Mark who recently announced his retirement from top flight hockey after many years service with Firebrands HC of Bristol. 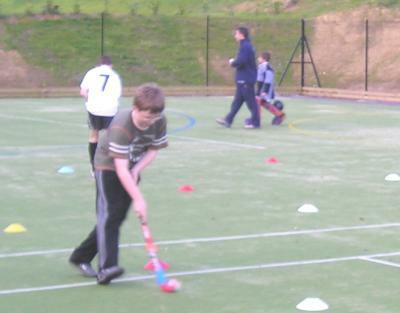 Wotton's young hockey stars continue to shine as the U-14 boys' recent tournament win proved. More encouraging are the amount of these young players who are regularly selected for the senior 2nd and 3rd XI's during the winter months as well as county representation at County level. Parents of children interested in taking part in further sessions over the summer can contact the hockey club's James Pullin on 01453-521223.